This new capability makes MMI a one-stop shop for original equipment manufacturers (OEMs). Stevensville, Md. (PRWEB) December 13, 2016 – Michigan Manufacturing International (MMI) announced today that it recently added new stainless steel and Inconel® seal ring production to its impressive list of capabilities. With this new service, technicians can now provide precision welding, making MMI a one-stop shop for original equipment manufacturers (OEMs). 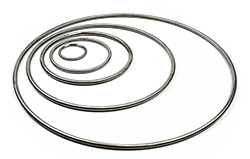 Stainless and Inconel® O-rings from MMI can be used for applications such as pressure control valves where non-metallic seals are not suitable or will not be reliable due to factors such as temperature or pressure. These long-lasting rings fabricated by MMI are made so the seam is indistinguishable from the rest of the ring. In addition to the standard profiles, MMI can design seals to meet the customer’s specifications. Stainless and Inconel® rings are used in various applications in the oil and gas, chemicals, plastics, aerospace, and semi-conductor industries. Founded in 1991, Michigan Manufacturing International (MMI) specializes in supplying manufactured to print assemblies and components to original equipment manufacturers (OEMs). Products include assemblies, castings, stampings, machined parts, gears, bearings and more. Services include product engineering, manufacturing, inventory management and stocking programs—all designed to streamline client operations and increase profitability. With manufacturing facilities in Stevensville and Hosur, India, and supply chain management offices in China (3), India, South Korea and Vietnam, MMI can provide the most effective, highest quality mechanical product solutions the world has to offer. For more information about MMI, visit www.michmfg.com or call 800-677-0504. Inconel is a registered trademark of Special Metals Corporation. Copyright © 2019 Michigan Manufacturing International.